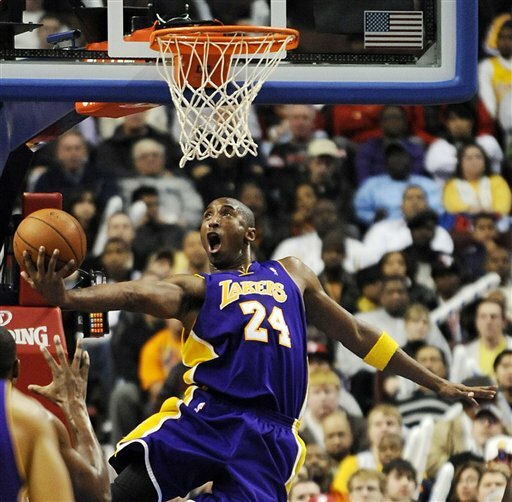 Kobe Bryant torched his hometown team again, scoring 32 to help the Lake-show rebound from a last-second loss with a 114-102 victory over the Philadelphia 76ers on Wednesday night. Pau Gasol had 22 points and 13 rebounds, and Andrew Bynum scored 18 points for the Lakers. Andre Miller scored 26 points and Iguodala had 19 for the Sixers, who played the entire fourth quarter and the last 4:50 of the third without Elton Brand. Brand left early with what appeared to be a hamstring injury. The Sixers said Brand had a strained right hamstring amnd only finished with three points on 1-for-7 shooting in 25 ineffective minutes. Brand will be evaluated on Thursday. So the game on Wednesday night was pretty sicko sitting in my girlfriends luxury box and it was one hell of a game. Dwight Howard did not dissappoint as he is a manchild and Elton had flashes of excellence as well. Too bad Rashard Lewis had to bang that 3 ball from the corner in the final few seconds to give Orlando the victory. And on to Sunday’s loss. Ben Gordon scored 21 points, Drew Gooden had 20 points and 12 rebounds, and the Chicago Bulls rallied from an early deficit for a 103-92 victory over the Philadelphia 76ers on Sunday. Bulls number one pick Derrick Rose contributed 18 points and 10 assists and reached double figures in assists for the first time in his young career. Former Sixer Larry Hughes had 16 points for the Bulls (8-9), who won for only the third time in 10 games on the road. Elton Brand had 21 points and 12 boards, and Thaddeus Young added 17 points for the Sixers, who have lost four straight to fall to 7-10. Andre Miller had 15 points and 10 assists, and Willie Green chipped in with 12 . Philadelphia scored a season low 78 points in a 24 point loss at Boston on Friday and has been held below the 100-point mark in seven straight games. Next up for the Sixers are the Chicago Bulls again tomorrow night from Chicago. YOUR Philadelphia 76ers put together one of their best performance of this short season so far on Wednesday night in Toronto. 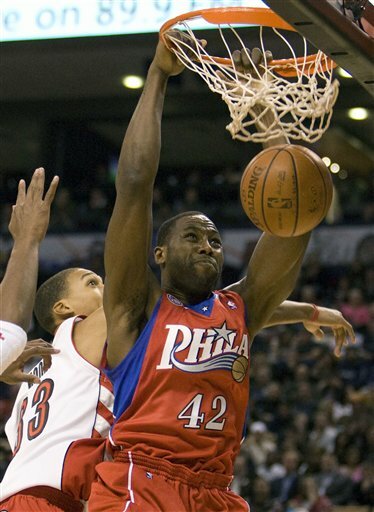 Elton Brand scored a season-high 25 points, Andre Miller and Andre Iguodala each had 18 and the 76er’s snapped a three-game losing streak by beating the Raptors 106-96 in the Air Canada Centre. Chris Bosh had 30 points and 12 rebounds, but Toronto still lost for the fourth time in five games after starting the season 3-0. Jermaine O’Neal added 19 points and 11 rebounds, and reserve Andrea Bargnani scored 15 for the Raptors. Next up for the Sixers are the Indiana Pacers on Friday night.